The Complete Works of Thomas Manton, 22 volume hard cover set - SGPBooks.com, Inc.
Sermons on Hebrews 11 continued and concluded. Several Sermons preached on Public Occasions. Sermons on Several Texts of Scripture, Part 1. John 14:1 ; Luke 12:48 ; Mark 10: 17-27. Sermons on Several Texts of Scripture, Part 1 continued. Mark 3: 5 ; Genesis 24:63. Sermons on Several Texts of Scripture, Part 2. 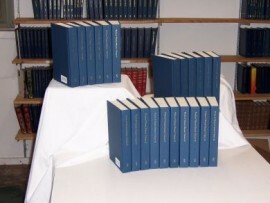 Sermons on Several Texts of Scripture. Luke 2:52 ; Philippians 2:7. Series of Sermons on Ephesians 5:1-27. 1 John 2:12-14 ; 1 John 3. Acts 2:37,38 ; 1 Peter 1:23 ; Psalm 19:13 ; Psalm 131 ; Ezekiel 18:23. Funeral Sermon Preached Upon the Death of Dr. Manton by Dr. William Bates.